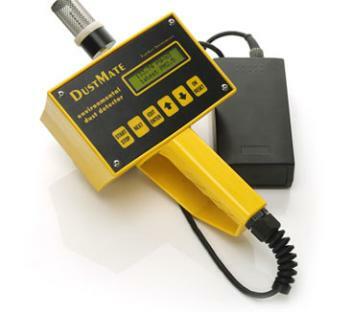 DustMate is a hand-held instrument with a very fast response which has been designed to locate sources of workplace airborne dust and fumes even at very low concentrations. Highly effective for checking air quality within buildings. Its one second time resolution also allows it to be used as a road-side indicator to identify high pollution vehicles as they pass. The instrument will continuously indicate the concentration of thoracic, inhalable and reparable particles down to 0.1 micrograms per cubic meter. In its environmental mode, it will indicate TSP, PM10, PM2.5 and PM1 concentrations.